For other uses, see Straight from the Heart (disambiguation). 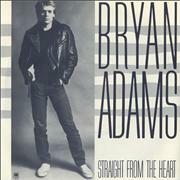 (1982) "Straight from the Heart"
(1983) "Cuts Like a Knife"
"Straight from the Heart" is a song recorded by Canadian rock musician Bryan Adams. It was released in February 1983 as the lead single from his third studio album, Cuts Like a Knife. It was his breakthrough song in the U.S., the first to make the top 40, reaching number 10. It also peaked at #32 on the Adult Contemporary chart, the first Bryan Adams single to appear on that chart. The song was written by Eric Kagna, a Vancouver singer/songwriter, and the instrumental bridge was contributed by Adams. The official songwriter credit is shared equally between Adams and Kagna. Adams did not release his version of the song until 1983. The song was first recorded by Ian Lloyd in 1980, on his album Third Wave Civilization. Australian singer Jon English recorded the song for his 1981 album, In Roads. The song peaked at number 72 in Australia. Later, the song was covered by teen band Rosetta Stone in 1982 (issued as a single in November that year, a month before Adams' version came out as a single). Welsh singer Bonnie Tyler released it on a 45 in the US in May 1983. It was featured on her 1983 album Faster Than the Speed of Night. ^ Viglione, Joe. "3WC (Third Wave Civilization)". Answers.com. Retrieved 2008-07-25. ^ Kent, David (1993). Australian Chart Book 1970–1992. Australian Chart Book, St Ives, N.S.W. ISBN 0-646-11917-6. ^ a b "Artist Chart History (singles) - Bryan Adams". Allmusic. Retrieved 2008-10-19. ^ Whitburn, Joel (1993). Top Adult Contemporary: 1961–1993. Record Research. p. 12. "Let Me Take You Dancing"
"Can't Stop This Thing We Started"
"There Will Never Be Another Tonight"
"Thought I'd Died and Gone to Heaven"
"Do I Have to Say the Words?" "The Only Thing That Looks Good on Me Is You"
"Let's Make a Night to Remember"
"I'll Always Be Right There"
"On a Day Like Today"
"Cloud Number Nine (Chicane Mix)"
"Why Do You Have to Be So Hard to Love?" "I Thought I'd Seen Everything"
"Tonight We Have the Stars"
"You've Been a Friend to Me"
"You're Not Alone (Australian Olympians song)"
"A Whiter Shade of Pale"
"Sitting on the Edge of the Ocean"
"I Believe in Your Sweet Love"
"Have You Ever Seen the Rain?" "Faster Than the Speed of Night"
"Two Out of Three Ain't Bad"
"And I Am Telling You I'm Not Going"
"Need Your Love So Bad"
"What You Need from Me"
"A Rockin' Good Way (to Mess Around and Fall in Love)"
"The Desert Is in Your Heart"
This page was last edited on 10 December 2018, at 07:00 (UTC).